The concept of Lopi is so central, so basic, so reliable: take the fleece of Icelandic sheep, the product of eleven centuries of controlled breeding in a climate guaranteed to produce hearty wool, card it into roving, and just knit with it. No spinning necessary! 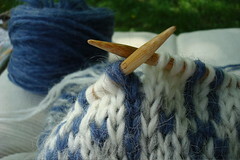 Need thicker yarn? 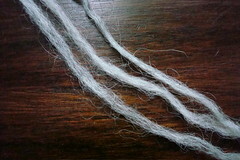 Knit with two “strands” of unspun Icelandic. Need more? Make it three. 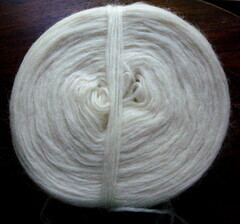 Lightly-spun lopi is lovely, too. Reynolds Yarns (now owned by JCA Yarns) brought it to the U.S. in the early 60s, and helped popularize the “Icelandic” yoke sweater in this country. The yarn itself is more twisted than spun, and comes in dozens of bright and muted colors, including the seventeen natural colors (some say more) supplied by the sheep themselves. Unspun comes in seventeen colors (nine dyed, eight natural). 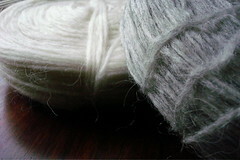 Reynolds’s Lopi comes in bulky and lite weights, which knit up at about 3 and 5 stitches per inch, respectively. If you prefer the airy strands of unspun Icelandic, Meg Swansen introduced (in Knitting Around the World, see reference, below) a great way to take advantage of the subtle gradations in natural colors: slowly transition to a new color by grafting (using the spit join method outlined above) a slightly different color to one strand, thus knitting with two strands of the old color and one of the new for a few rows, then repeating so that you have two strands of the new color and one of the old, then finally complete the color change to three strands of the new color. This is particularly effective for stranded color work, in which colors can be graded for foreground and background. Iceland the country is a place of spectacular, dangerous beauty I have always wanted to visit. Alas, I have gone no further than the airport during a short layover. Reynolds’s marketing department very wisely decided to stage its photo shoots in Iceland, where models would pose in large, yoked sweaters against otherworldly landscapes. I have collected a few examples from the sixties (as reproduced, right), but the ones I first saw were from the eighties. Those images always spoke to me of casual elegance and made me want to whip off “an Icelandic” when I was first yearning to knit in high school. I remember a friend had designed an Icelandic-style sweater with abstract heads as design motifs; it was so warm that she could wear it instead of a coat throughout most of the winters she spent in Vermont. 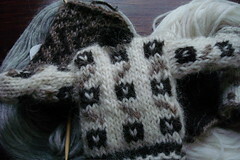 The first sweater I ever tried to knit was an Icelandic. I had no idea what I was doing and no one to guide me; I just bought some yarn from a yarn store in Turkey, where I lived. I have no idea what kind of yarn it was because I didn’t know Turkish well enough to ask the clerk about the fiber (and I doubt I would have known to ask). I just picked a few colors I liked and asked for enough for a sweater. Needless to say, I never finished it. All I recall is that it was destined for my brother and contained purple and gray (probably not his choices!). I made up the loss to him a few years later with a Fair Isle sweater. And I did eventually make one of those fabled Icelandic sweaters, and was delighted at how quickly it progressed at three stitches to the inch. I think the yarn I used was actually from New Zealand. But back to Iceland: Situated at the cross-section of the North American and Eurasian tectonic plates, it lies atop a mantle plume of molten rock. This geological phenomenon has spawned volcanoes that threaten the Icelandic population—sometimes with catastrophic results—forging and re-forging an ever-changing landscape. Undaunted, Icelanders make the most of this unstable geology; almost 20% of Iceland’s energy is geo-thermal! Iceland’s harsh, ethereally beautiful landscape includes geothermal fields, spectacular waterfalls, hot springs, even a blue lagoon (partially a natural formation, but waters fed by a geothermal power plant). Not limited to physical beauty, Iceland has also earned the moniker, “land of sagas.” Colonized by Vikings in 874, Iceland has survived natural disasters (earthquakes, volcanoes, floods), famine, plagues, isolation, and pirate invasions to emerge as an independent, progressive country that is as urbane as it is proud and protective of its history and traditions. A poet with the unlikely name of Snorri Sturluson helped record some of the sagas in the twelfth century, and generated a tradition of recording family epics (mostly blood feuds) that make the Hatfields and McCoys seem tame in comparison. Perhaps because of isolation or deeply-valued tradition, Icelanders retain a few letterforms that have been absent from my language since the Middle Ages. Icelandic is not so far removed from Old Norse, which was written and spoken at the time of Old English (also sometimes called Anglo Saxon ca. 450 to ca. 1150). The eth (ð Ð), thorn (þ Þ), and aesc (“ash”—Æ æ) survive in modern Icelandic almost as artifacts, and exude medievalism (they make me wonder if this blog should be called “Knitting Letters, A to Þ?”). And back to knitting: I’ve taken a very, very simple idea: a repeated L pattern, in which L’s appear backwards, forwards, upside down & reversed in several different sizes. The main L’s have slight serifs, and somehow the overall effect to me looks Chinese, although I was trying to form a central cross, which appears rather often in Icelandic design as a motif. I used three colors of unspun Icelandic yarn, never more than two at a time, each of which was in three strands for a chunky yarn. 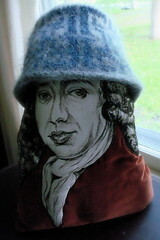 The design forms a cylindrical hat, which I then felted (before felting, left; after felting, right), and caused Samuel Pepys to wear. If it had felted too much, it would have made a nice bowl. When I have time, I’ll post the pattern. Pictures of Iceland, ca. 1900, taken by Frederick W. W. Howell & Magnús Ólafsson. Cornell University Library, Division of Rare and Manuscript Collections. Fiske Collection. Caution: Pop-up blockers must be disabled! 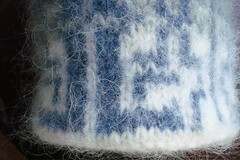 Meg Swansen, “Make a Wooly, Warm Coat: Knit mirror-image Turkish patterns in Norwegian-style with Icelandic wool”, in Knitting Around the World from Threads (Newtown, CT: Taunton Press, 1993): 78-83. Thanks, Dee D! I only wish I had been to Iceland so I could add some pictures of that spectacular country. It's a very interesting trip to the Lopi country. I went to Iceland. It's so beautiful and strange. I wish I will go back again. Also never try to spit splice Lopi after eating an Oreo. Just FYI. "L" is for laughing after reading adrienne's comment. 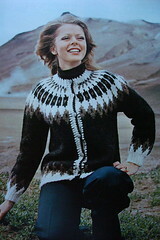 My first sweater was an Icelandic yoke sweater. I did all things that are classic for a beginner - unerestimated the size, didn't make a swatch (I think). And I didn't consider that the weight might be a bit impractical for this area's climate. Needless to say, i didn't wear it much. And eventually I just cut it open, sewed down the cut edges, and use it in the winter when I have to go outside to do some yardwork. You're so right, Lola -- I'm told that the one I made is brought out & conspicuously worn by its owner when she wants her husband to build a fire. L is also for learning. Thanks for teaching us about unspun yarn.